Much like in commercial foodservice, diners at noncommercial foodservice settings are always looking for something new and delicious to try. In noncommercial settings, however, operators have a little less wiggle room to menu the latest trends since they have to be crowd-pleasers as well as fit within a budget. However, there are a couple of trends that are making a big impact in healthcare foodservice: Plant-forward dishes and global mash-ups are popping up on healthcare menus all over, and for good reason—according to Technomic’s 2017 Center of the Plate: Seafood & Vegetarian report, 59% of consumers eat meatless meals once a week or more, and according to Technomic’s 2017 Flavor report, 65% of consumers say they like trying new flavors from time to time. For operators trying to make sure they’re offering consumers the foods they’re looking for, vegetable-focused foods as well as globally-inspired pasta dishes hit the mark. Pasta dishes are the perfect carrier for these trends, as they provide a nutritious, filling base and are a familiar ingredient that consumers know and love. The majority of people who occasionally eat vegetarian or vegan items aren’t necessarily vegan or vegetarian—in fact, in Technomic’s Seafood & Vegetarian report, 53% of these consumers say they don’t avoid any meat or animal products. With that in mind, chefs are showing a lot of love to vegetables, prepping them in new and perhaps unusual ways, but served up in a familiar context like pasta. Thus, produce has become a bit of a star on menus, from charred and glazed Brussels sprouts dotted with crisp pork to linguini dressed with pesto made from carrot tops. Roasted, sauteed, grilled and stir-fried veggies are popping up all over, and attention to flavor has helped them become the center of the plate, rather than just the side. For instance, dishes such as whole-grain penne with carrots, turnips and gorgonzola offer a delicious, savory and vegetable-heavy play on classic pasta dishes, while a vegan “power bowl” with rotini, quinoa, baby kale and maitake mushrooms packs a superfood punch perfect for those looking for something lighter. For the 43% of consumers who say they think vegetarian meals are typically healthier than nonvegetarian options, according to Technomic’s Seafood & Vegetarian report, these plant-focused foods are just what the doctor ordered. Flavors from around the world are trending as well. From Korean-spiced broccoli to smoky peppers accenting Mexican dishes, global mashups and influences are proliferating on commercial and noncommercial menus alike. From street-food inspired appetizers to fusion foods taking over the entree section, big and bold tastes are what’s hot right now. And according to Technomic’s Flavor report, dishes that blend flavors from around the world are appealing—diners ages 18- to 34-years-old say they like dishes that feature a fusion of flavors from more than one type of cuisine. For operators who want to offer their diners interesting, craveable, and full-flavored dishes, while still making them approachable, using pasta as a base is the perfect springboard. 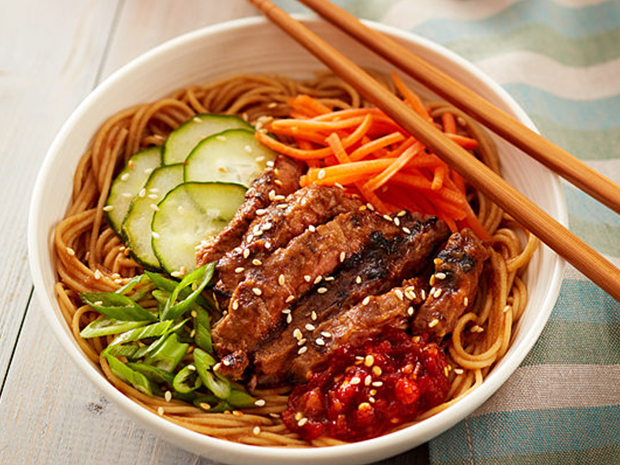 Offer up a bulgogi beef whole-grain noodle bowl and top it off with Sriracha or sambal for additional heat and garnish. Or go in a completely different direction and offer a Latin take on mac and cheese. Baked campanelle pasta with poblano cream and guajillo-glazed shrimp offers big flavor and smoky heat from the guajillo and poblano peppers, and for an additional kick, pepper Jack cheese just ups the ante. Healthcare foodservice is taking it to the next level with these trends. With unique ingredients and a vegetable-forward focus, diners can experience all the foods they’re looking for, even without checking out the trendiest spots in town.